Circa 1914. "U.S. Army or National Guard." Among the comestibles behind the cash register: Fig Newtons, Social Tea Biscuits and Marshmallow Dainties. National Photo Company Collection glass negative. View full size. Submitted by Andrew Breza on Fri, 06/05/2009 - 2:56pm. I wouldn't be all that surprised if some of those items are still on the shelves at a PX somewhere. Submitted by Fred on Mon, 06/01/2009 - 7:27am. Bull Durham fine smoking tobacco & paper on the next shelf under the Prince Albert. Submitted by Chaco on Mon, 06/01/2009 - 4:59am. Somehow I just do not see any of these guys consuming "Marshmallow Dainties"! Submitted by fanhead on Sun, 05/31/2009 - 5:53pm. From the goofy expressions and crooked hats I'm wondering what they're drinking. Whatever it is I want some. Submitted by Anonymous Tipster on Sun, 05/31/2009 - 3:24pm. Also graham crackers and Colgate tooth powder. This establishment is properly called a PX (Post Exchange) tent, but we (in the 1990s) called it the "pogey bait" tent. Which is what these guys probably called it; that term for munchies and other assorted goodies is older than dirt. Locating the pogey bait tent is usually the first objective after you've set up your bivouac area. You know, you could take these guys to a modern Guard summer camp and they'd feel right at home. Or vice versa. The Army never changes. Submitted by Shay on Sun, 05/31/2009 - 1:40pm. Was the photographer tipsy, or the sutler? That tent is much more than half a bubble off plumb. Submitted by Susan811 on Sun, 05/31/2009 - 12:09pm. I'm trying to figure out what the guys are drinking. Would it have beer or some kind of soft drink? Since the bottle is clear, and not green or brown, I thought it might be soda since there's a head on it. Anybody? Submitted by Anonymous Tipster on Sun, 05/31/2009 - 11:10am. And Colgate Dental Powder to take care of the cavities. We know what they are smoking, but what are they drinking? Root Beer? Submitted by stinky on Sun, 05/31/2009 - 9:41am. they're all drinking Moxie! How can we tell? Because most of it is still in the bottles - and, very probably, stayed there. My New Word For Today! Submitted by Mal Fuller on Sun, 05/31/2009 - 9:39am. Submitted by allie on Sun, 05/31/2009 - 9:36am. Sort of like Evian water--naive spelled backward. Submitted by Anonymous Tipster on Sun, 05/31/2009 - 9:31am. Wow! 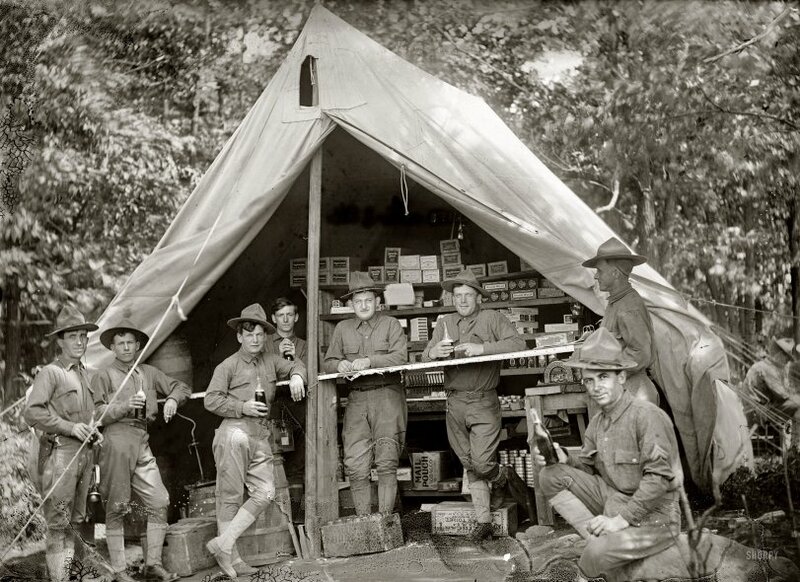 The pre-WWI Army PX offered tobacco to smoke or chew, soda pop, sugary snack foods of all description (no high-fructose corn syrup), and what looks like a brew keg with a tap back there in the tent. Where do I sign up? Wait a minute ... where's the female companionship? Don't ask, don't tell. Submitted by Anonymous Tipster on Sun, 05/31/2009 - 6:47am. Tobacco plug cutter between the corporal's hat and Prince Albert in a can! Submitted by Doug on Sun, 05/31/2009 - 6:05am. Prince Albert in a can. Just under the Marshmallow Dainties. Submitted by hopita on Sun, 05/31/2009 - 12:17am. I spy Uneeda Biscuits as well. I always thought that was such a clever name -- "Uneeda Biscuit."